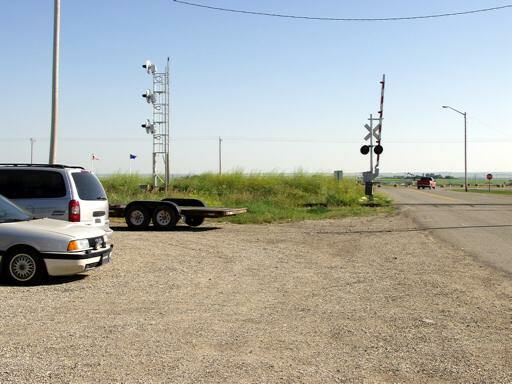 Take Hwy 24 to Carseland and turn north onto Range Road 260, crossing the railroad track. The site is ahead to your right (east). The Signal Gas Station scene was initially deemed a critical one. We are told that the decision to break the opening scene into a Cowley component (moving train, Aguirre’s Trailer) and a Carseland component (Drop Off, Signal Gas Station, and Signal Bar) was largely motivated by the visual appeal of the Quonset building gas station in Carseland. Indeed, another gas station candidate in Rockyford was passed over to capture the “perfect” Carseland gas station. Though it was subsequently cut, the Signal Gas Station scene was intended to establish the story’s place, and tell us important things about both Ennis and Joe Aguirre. The truck stops with a screech of air brakes in front of a service station just opening for the day. An OLD MAN is rolling a tractor tire as big as he is into the garage. Ennis steps out of the truck, no suitcase, just a grocery sack stuffed with his only shirt and pair of Levi’s. The truck moves again, almost before he hits the ground, spraying him with dust. Tall, raw-boned, lanky, possessed of a muscular, supple body made for the horse and for fighting. He stretches. Looks at the OLD MAN, who looks back at him sourly. One of ENNIS’S boot heels is worn, has to adjust for the turn of the heel as he walks. No one is in sight on the streets of Signal. After a moment, carrying his sack, ENNIS walks (off) ... over to the OLD MAN, who is balancing the tractor tire against a pillar. ’Scuse me. Mightin’ you tell me where the Farm and Ranch Employment Office is at? In that trailer house. Three blocks down. You’ll see it. Ennis nods, tips his hat, starts off. Don’t let that goddamn Joe Aguirre send you up to Brokeback without no thirty-ought. There’s coyote’s up there, they’ll eat your damn sheep and your damn jackass, too. With a thirty-ought, you might hold your own. ENNIS, surprised by this torrent of words, clears his throat. The OLD MAN kicks at the tractor tire a time or two, as if irritated it exists. Looks at ENNIS. Where was you raised, bud? Why, that ain’t hardly in Wyoming, that’s nearly to Utah. You ain’t a damn Mormon, are you? No, sir. I just never heard a no place called Brokeback. Don’t you let that damn Joe Aguirre send you up there with no twenty-two. Coyotes don’t mind a twenty-two. Make sure he gives you a thirty-ought. Too much talk for ENNIS, who nods his thanks. Looks up at the mountain as he walks off. The scene establishes the location as the mountain country of Wyoming and tells us what Ennis is doing there. It emphasizes Ennis’s youth and vulnerability, and explains Joe Aguirre’s role. The image of the huge tire, which appears twice in the scene, is an example of the type of rich, sophisticated foreshadowing that makes the film deeply coherent and meaningful. 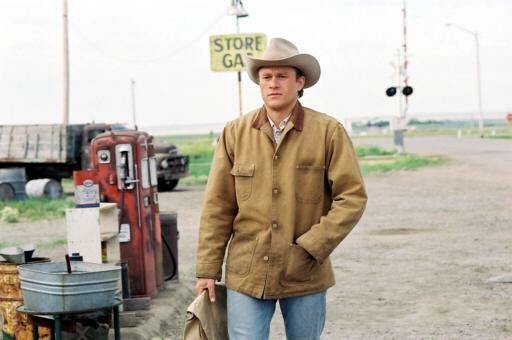 The Signal Gas Station, the old man, and the tractor tire are featured again in two separate places later in the script, in the brief scenes in which the Basque drives Jack and Ennis to, and from, the staging area. (These were also deleted.) David Trimble, who played the Basque, remembers that the most difficult part of shooting these scenes was driving the old truck, which had an archaic manual transmission. What happened to the Signal Gas Station scene? The most compelling reason for omitting it is that it postpones some of the film’s most artful imagery. The captivating encounter between Jack and Ennis outside Joe Aguirre’s trailer is one of the film’s jewels and, as such, deserved prominent placement. Additionally, the film, like the story upon which it is based, is masterfully tight. By removing this scene, Lee gave Brokeback Mountain added directness and impact. DVD Chapter 1, 00 01 21; Chapter 2, 00 06 58, 00 08 17.